Tackling Common IT Challenges and Highlighting New Opportunities for Google Cloud Platform and Google Apps users, administrators, and developers. Have you ever needed to access your own computer remotely? I'm talking about actually using your computer from another computer, as if you were sitting at the keyboard. Well, you can! 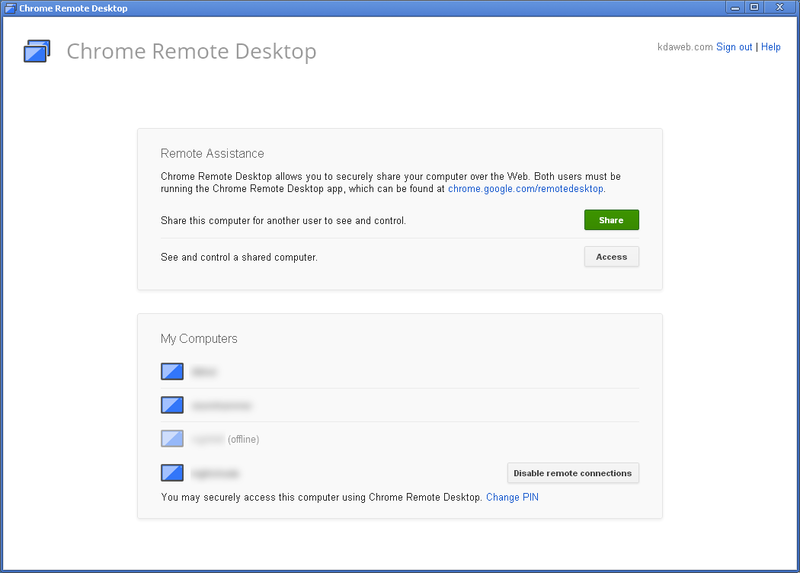 Google provides a free extension to the Google Chrome web browser called Chrome Remote Desktop that allows you to use your computer from just about anywhere. Chrome Remote Desktop is a nifty tool with positive implications on the user level as well as the organizational level. That is, users can get more done and are able to use computing and information resources with improved flexibility. Organizations can benefit by concentrating their efforts and their resources more efficiently than was ever possible before. This can lead to significant cost savings. I've used the Remote Desktop Protocol (RDP) tool that Microsoft provides for accessing Microsoft Windows remotely and X11 through a Secure Shell (SSH) tunnel. Typically, however, I wind up copying files from the remote computer to wherever I'm working and edit them there. If I'm lucky, I'll remember to put the edited files back when I'm done. This process works fine for some uses; however, for others it's a bit of a strain. Chrome Remote Desktop provides me with my desktop in a window. I see what's on the other computer, my keystrokes and mouse movements affect the other computer, an so on. It's just like any other remote desktop tool. I don't have to use the same platform as the computer I'm connecting to -- I can access a Windows computer from a ChromeBook, for example. I don't need to do any fancy firewall modifications -- Chrome Remote Desktop uses standard HTTP traffic over standard HTTP ports (encrypted, of course); if both systems can access the world wide web, I can use Chrome Remote Desktop to access the other. IP addresses and hostnames don't matter -- even if both computers are behind NAT firewalls with private, non-routeable IP addresses, they can still use Chrome Remote Desktop. Alternatively, as an end-user, I can associate my device with my Google Apps account and provide a PIN number for that device. I can then go to another device with Chrome Remote Desktop, log into my Google Apps account, and then I'll get a list of devices that I can access. I select the device I want to access, provide the PIN number I previously assigned to that device, and then I can see the remote device's desktop. Chrome Remote Desktop requires the Google Chrome web browser as well as a Google Apps account. There are all kinds of reasons why you might want to access your computer remotely. Maybe you have your settings just right; maybe your work terminal has access to resources (file servers, network applications, etc.) that you need in order to work from home. Maybe you left a proposal you were working on over the weekend on your home computer. Maybe you need a change of scenery and you want to continue working from the corner coffee shop on your laptop . Regardless of the reason why, Chrome Remote Desktop allows you to make it happen quickly and easily. The only caveat is that you'll need to install Chrome Remote Desktop, allow access, and provide a PIN on the device you want to access before you can access it. Example 2: I want to see another user's screen so I can help the user with a problem. This is a common desire for anyone who has ever worked an IT help desk or who has just tried to help somebody do something on their computer over the phone. Just the other days, somebody called me and needed help. I kept asking questions such as: "What's on the screen now?" "What happens when you right-click?" "Is there an icon that looks like a little floppy disk up in the toolbar?" I was struggling to help the caller who was simultaneously becoming increasingly frustrated. I knew that the caller had installed Chrome Remote Desktop already, so I asked the user to launch Chrome Remote Desktop and share access to their computer. The caller read the PIN number over the phone and two seconds later, I saw the user's desktop. To make a long story short, we were able to resolve the problem seconds later. This is very common. By altering the firewall to allow traditional remote desktop client access, the network administrator would be opening a hole in some carefully-constructed defenses. Not only does this requite the network administrator to stop what he/she is doing to accommodate the end-user's request, but it also complicates the firewall configuration. Most importantly, this is yet another vector that an attacker could use to circumvent the security of the network. Chrome Remote Desktop uses secure, encrypted HTTP traffic over standard HTTP ports. 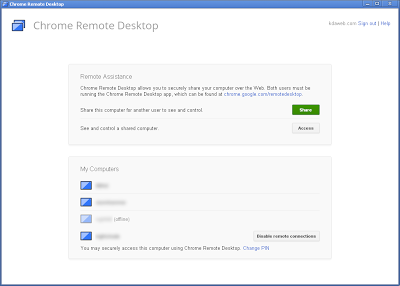 As a result, if both computers can access the web (e.g., they can open a web browser and access web pages), then Chrome Remote Desktop can be used to allow one device to access the other without altering any firewalls or network settings. This even works if one or both of the devices are protected by Network Address Translation (NAT), such as the protection provided by consumer wireless routers. Typically, if you're in a very homogeneous environment (e.g., all of the computers are running Microsoft Windows), you can use the operating system's remote desktop mechanism without a lot of difficulty. However, if you're in an an environment that has a mix of different types of platforms, you'll wind up installing (and using) multiple remote desktop tools, one for each type of system you're trying to access. With Chrome Remote Desktop, it doesn't matter what platform your device or the device you're trying to connect to is using; it all works just fine using one tool. This situation can occur with Google ChromeBooks or tablets; many end-users won't be able to install Microsoft Word or Microsoft Excel. Normally, this isn't a problem as Google Docs can read and write standard Microsoft Office formatted files. Sometimes there's a particular function that only Microsoft Excel provides that is not available under Google Docs (it's hard to believe, but it does happen every once in a blue moon). A possible solution is to set up a central server that has Microsoft Office installed on it and allow end-users to use Chrome Remote Desktop to access that central server. This is a typical situation in the education industry. It's not uncommon to have hundreds of computers available to students through labs. If a faculty member requires a special (and expensive) piece of software, the cost of purchasing licenses for hundreds of computers can be quite ugly. If that software package is installed only in a specific lab, issues such as availability crop up (e.g., when can students access the lab? what if the lab is otherwise occupied by students who aren't using the software that's only available in that lab?). Centralized servers can be set up to provide access to the special software; students can then use Chrome Remote Desktop to access the central servers and the special software. Once that's set up, lab computers can be configured as general-purpose computers (or even replaced with $200 Google ChromeBooks!). Then, students who need access to that special software don't need to go to a specific lab. This works very well with most -- but not all -- software packages. Some software packages (such as video editing tools) continue to work best when installed to local computers with lots of memory and processor capacity. One school that I worked with had roughly 2,000 FTE (Full Time Equivalent) students. They had dozens of labs spread across campus, some of which were open 24/7, and averaged hundreds of logins an hour during a typical semester. The organization was spending about $250,000 / year on computer hardware replacements and about as much on software licensing. After some study, it was estimated that this campus could save about $350,000 / year (a 70% savings) in hardware and software costs alone by switching to Google ChromeBooks with a handful of department- and centrally-maintained servers. In summary, Chrome Remote Desktop can help any organization -- a business, a nonprofit, a college, a government entity, and others -- transform the way things get accomplished. Users can access the information and resources that they need quickly and easily. This increased flexibility can result in significant cost savings and improved productivity. -- Wes Dean, a Google Apps Certified Deployment Specialist and a Google Apps Trusted Tester, is Principal of KDA Web Technologies, a Google Apps Authorized Reseller. To learn how Wes and KDA Web Technologies can help you, go to http://www.kdaweb.com/. Does not work on Android of IOS yet. I'm eagerly looking forward to when they do! Have you tried the 2X RDP Client for Chrome? I checked out that link and I have to say that it looks like a good find. For anyone who hasn't looked at it yet, there are clients for iOS and Android as well as several other interesting platforms. It looks pretty cool! Copyright © 2011 - 2015 KDA Web Technologies, Inc. All Rights Reserved.. Powered by Blogger.